Henrik Zetterberg scored two goals for the Red Wings. DALLAS (AP) — The new year has meant a new start for Jimmy Howard. 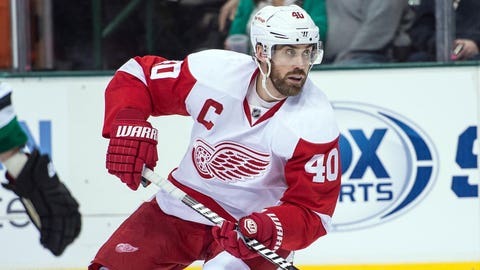 Jimmy Howard made 44 saves and Henrik Zetterberg scored two goals, leading the Detroit Red Wings to a 5-1 victory over the Dallas Stars on Saturday night. The NHL has fined Toronto Maple Leafs forward Joffrey Lupul for his hit on Red Wings forward Patrick Eaves. Zetterberg, Joakim Andersson and Drew Miller scored in the first period goals for Detroit. Tomas Tatar added one in the second, and Zetterberg finished the scoring in the third. "When the clock struck midnight the other night to end 2013, I put everything behind me," Howard said. "I just said, `Here’s a new clean slate and let’s start fresh,’ and I’ve been trying to do that." In the first three months of the season, Howard had a 6-9-7 record. He’s now 1-0-1 in 2014, with only three goals allowed in 125 minutes. "It’s been a while since I’ve had a game like this for the guys," Howard said. "They deserve a lot of them out of me so this is going to be the first of many for me down the stretch." Dallas outshot the Red Wings 45-27, but also gave the puck away 17 times — compared to four by the Red Wings. Dallas also went 0 for 7 on the power play. "It wasn’t pretty by any means but we found a way," Howard said. "We capitalized on our chances here tonight and our captain (Zetterberg) was good tonight, too." The Stars had a 20-13 advantage on shots in the first period, but trailed 3-1. They had the game’s first 12 shots, but Zetterberg scored the first goal on the Red Wings’ first shot at 7:04. After Gustav Nyquist whiffed on a shot, Dallas goalie Dan Ellis tried to clear the puck. It went out to Zetterberg, who didn’t miss his shot. "When Zetterberg got on the board, I thought we got it going," Red Wings coach Mike Babcock said. Zetterberg has 14 goals this season, including three goals and three assists in four games since returning from a back injury. Dallas tied it on Rich Peverley’s short-handed goal with 7:13 left in the period. He shot from the top of the left faceoff circle past both Shawn Horcoff’s screen and Howard. "Howard made some real good saves," Stars coach Lindy Ruff said. "There was a couple that I thought we could have had better traffic in front of him. We missed the net on some. "We would play well, be down in their end and then give up the puck and they’d go down and score." Detroit’s Justin Abdelkader missed a penalty shot with 5:58 left, skating to the left of the net and trying to tuck the puck behind Ellis, but the goalie smothered it with his pads. Andersson put the Red Wings back ahead for good lead with a shot from the right circle over Ellis’ right shoulder with 1:55 to go in the first. Just 14 seconds later, Miller scored from a scramble in front. Dallas appeared to have a goal midway through the second period. Howard stopped Peverley’s backhand shot but the puck came loose across the goal line after Peverley took another swipe at it. The play was ruled no goal. "It was a turning point, but at the same time, we’ve still got to fight through things," Peverley said. "We could have done a better job regrouping." The Red Wings took a 4-1 lead with 8:03 left in the second as Tatar split defenders at the blue line for a breakaway and his backhand went off Kari Lehtonen, who had replaced Ellis to begin the period, and into the net for an unassisted goal. "They had a lot of odd-man rushes," Horcoff said. "It wasn’t the type of game we want to play. We want to be quick in transition, but we can’t be giving away pucks like that. We can’t be giving up quality shots. "A lot of our shots tonight were from the outside. We didn’t get a lot of good second shots." The Stars had nothing to show for a period during which they had a 15-5 advantage in shots and three power plays. Zetterberg took a pass from Dan Cleary and one-timed the puck past Lehtonen from the left circle with 7:21 remaining. Dallas lost its second consecutive game, both at home, by a combined score of 11-5. NOTES: The Red Wings entered the game with the NHL’s third-best road record, and improved to 13-4-3. … Detroit C Pavel Datsyuk and D Danny DeKeyser did not dress. DeKeyser has a groin injury, but Datsyuk’s absence wasn’t explained. He didn’t practice Friday, but skated with the team Saturday morning. … D Alexey Marchenko, the Red Wings’ seventh-round draft pick in 2011, made his NHL debut. He drew a hooking penalty 4:30 into the game. … Dallas recalled Chris Mueller from Texas of the American Hockey League Saturday as insurance because four forwards — Horcoff, Peverley, Tyler Seguin and Ray Whitney — had been sick. The four all played, so Mueller was inactive. … Stars D Aaron Rome left the game in the second period because of an upper-body injury.